By CNN'S DAKIN ANDONE, JAMES MASTERS, DAVID WILLIAMS AND AMANDA WATTS CONTRIBUTED TO THIS REPORT. (CNN) - At least 12 lives were cut short Wednesday when a gunman stormed a Southern California bar and opened fire. On Friday, the Ventura County Medical Examiner confirmed the identities of all the individuals killed. Here's what we know about the people who died in the shooting at the Borderline Bar & Grill in Thousand Oaks. A 29-year veteran of the Ventura County Sheriff's Office, Ron Helus was hoping to retire in the next year or so. He loved spending time with his son fishing in the Sierras, friend and colleague Sgt. Eric Buschow said. He leaves behind his wife, too. Policing was in Helus' blood, Buschow said. He worked on drug investigation assignments, served on a SWAT team and was a firearms instructor for recruits at basic training. He also had his own business teaching gun safety to people seeking concealed weapons permits. "He had just a natural instinct for going after crooks, and he did it with enthusiasm, with a great deal of intelligence," Buschow said. Before he responded to the shooting, Wednesday night was like any other busy night for him, backing up fellow deputies on every call that he could, VCSO Senior Deputy Julie Novak told CNN affiliate KCAL/KCBS. Helus was among the first officers through the door at Borderline. He was shot several times as he tried to stop the rampaging gunman, Ventura County Sheriff Geoff Dean said. United Methodist Church Westlake Village identified another victim, Noel Sparks, as a member of its congregation. Sparks was a gifted dancer and artist, her friend Sarah Penrose said. The two met in Bible study at Calvary Community Church, Penrose said. Sparks always appeared to be serving at church or leading groups of young girls. "As we say at Calvary often, she lived and loved like Jesus," Penrose said. "She was genuinely caring, and loved serving people. She definitely left a legacy of selfless servitude." Dan Manrique was a Marine Corps veteran whose service continued after he returned stateside. After serving with the 2nd Combat Engineer Battalion, 2nd Marine Division, as a Radio Operator, and deploying to the Middle East in 2007 with the 26th Marine Expeditionary Unit, he joined Team Red White & Blue, a veterans organization, in 2012. "Dan's life was dedicated to serving others, during his military career and beyond," said John Pinter, executive director of Team RWB. "We offer our deepest condolences to the Manrique family and ask that our Eagles around the world join us in keeping all those impacted by this tragedy in your thoughts and prayers." California Lutheran University identified one of the victims as Justin Meek, a 23-year-old recent graduate who "heroically saved lives in the incident," university President Chris Kimball said. Meek was a criminal justice and criminology major who worked in the Veterans Resource Office for two years for the work-study program. He planned events and helped veteran-students with their VA certifications, said Jenn Zimmerman, Cal Lutheran's veterans coordinator. He had just returned to Cal Lutheran to support the Country Line Dance Club with Borderline, Zimmerman said in a statement. "He loved running college night and always seemed to draw a crowd." He was also part of the Kingsmen Quartet and sang the National Anthem at graduation, Zimmerman said. He was set to sing with the Disney Carolers for the holiday season. "He was planning to join the US Coast Guard, a compromise between his Air Force veteran mother and his Navy SEAL father. He enjoyed cooking for others and often brought his leftovers for us to share as we envied his cooking skills." He was going to cook for everyone at the school's Veterans Day Celebration on Monday, Zimmerman said. "Since he can no longer be with us, we will hold a memorial in his honor. Justin was a real go-getter and had his whole life ahead of him. He will be deeply missed in our community." 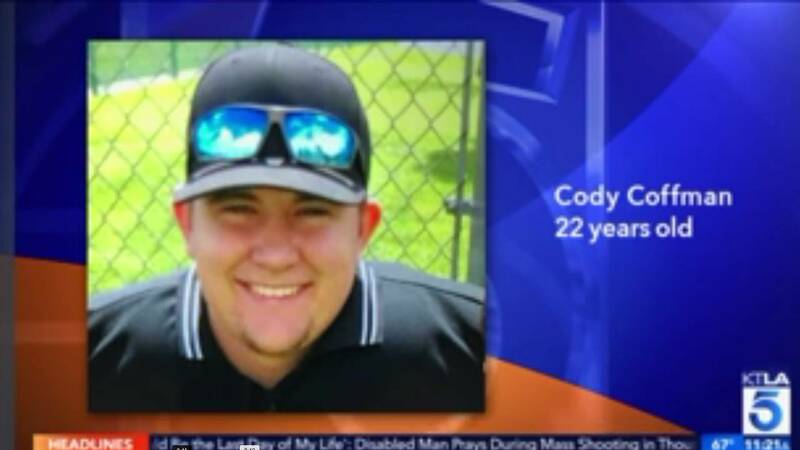 Cody Coffman had just turned 22, and was in the process of talking to Army recruiters, his father said. He was the head umpire for a local baseball league, a role that brought him into contact with many people, his father Jason Coffman said. Coffman was the oldest of four boys, and the family was expecting its first girl, Jason Coffman said. "Cody was the big brother that my kids need," Jason Coffman said, wiping away tears in a Thursday news conference. "He was so excited to have his first sister, and now she'll never know." An aunt and uncle of Pepperdine student Alaina Housley confirmed that she died in the shooting. "Alaina was an incredible young woman with so much life ahead of her and we are devastated that her life was cut short in this manner." The couple earlier used Twitter and Instagram to seek information about and prayers for their niece. Pepperdine University shared condolences with the Housley family. "Our hearts are broken with the news of this profound loss," the school said in a statement. "We offer our deepest condolences to the Housley family and ask that our community join us in keeping Alaina's family, friends, and loved ones in their prayers during this incredibly difficult time." Telemachus Orfanos' mother confirmed to CNN affiliate KABC that her son was among the dead. According to Susan Orfanos, her son had survived the mass shooting at the Route 91 music festival in Las Vegas last year. But this time Telemachus didn't come home, she said, and she wanted to see real change. "My son was in Las Vegas with a lot of his friends and he came home," she said. "He didn't come home last night, and I don't want prayers. I don't want thoughts. I want gun control, and I hope to God nobody else sends me any more prayers." Royal High School's wrestling team confirmed in a Facebook post that its former coach Sean Adler was killed in Wednesday night's shooting. According to Royal Wrestling, Adler was a bouncer at the Borderline Bar and Grill. Adler had worked with the team as a strength coach a few years ago, the post said. He was in the process of transitioning careers, but still found the time to coach. "He traveled with us through some of the roughest times we had as a program," the post said. "He was positive, motivational, and truly wanted the best for the people around him." "Thank you Sean for your help and most of all your friendship." Mark Meza Jr. -- known to his family as Marky -- was also killed, according to a statement obtained by CNN affiliate KEYT. "Marky was a loving and wonderful young man who was full of life and ambition," the statement said. "His family is devastated by his loss." The statement added that Meza would have celebrated his 21st birthday on November 19. Blake Dingman changed his brother's life forever, Aidan Dingman said. Aidan wrote in a tribute to his brother on Instagram that his family raced to the scene of the shooting when they learned about it. They tried to get in touch for hours, but finally received the confirmation that the 21-year-old had died, along with his friend Jacob Dunham. "Blake, I love you so much and I miss you more than you can imagine," Aidan wrote.